If your house is located on the top of the Mount of Olives, eventually you will find yourself picking olives. So yesterday we participated in the olive harvest. The Lutheran World Federation Compound has 800 olive trees that are harvested each October and November to raise money for "The Poor Fund" to assist Palestinian families who cannot pay their medical bills at Augusta Victoria Hospital. 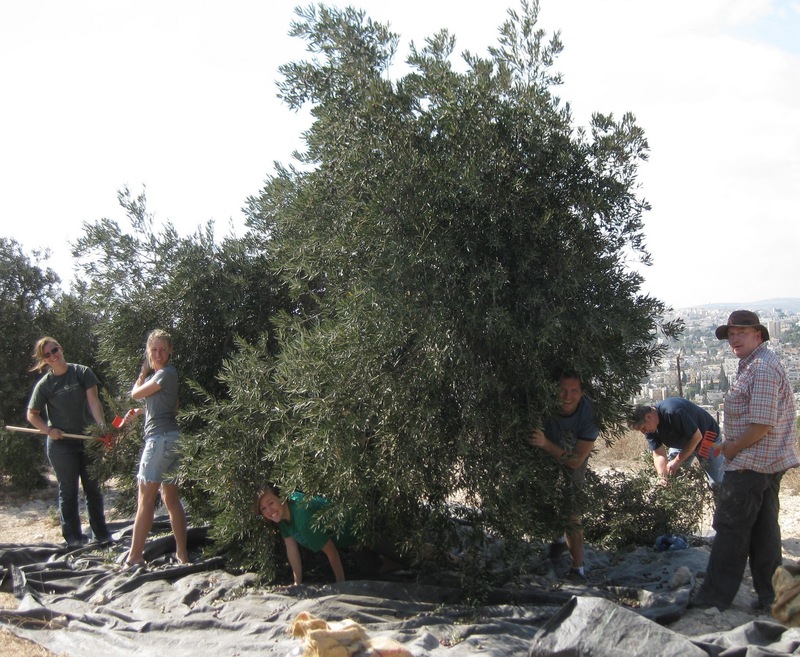 All the olive picking is carried out by volunteers: Classes from various schools, tourist groups, and individuals who are willing to get a little dirty for a good cause. Our congregation spent all of Saturday picking olives. Today a group from the American Consulate is here. Next week Swedish and Finnish groups will lend a hand. Two recent college grads supervise the project. Brit is here serving a two-year internship with the LWF and organizes groups for the olive harvest. Warren has come for three months this fall to prepare the grove, to trim the trees, and to haul the olives to the olive press, all before he heads off to grad school next January. From the photo below on the right, you can see from the smiles of Brit and Warren how satisfying it is to take on such a venture. 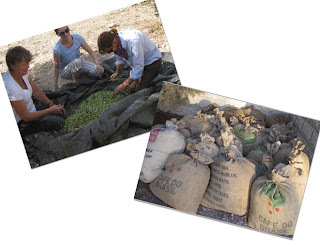 As you can see from pictures below, the process involves laying out large tarps underneath the branches and then pulling the olives off the tree with a plastic rake. 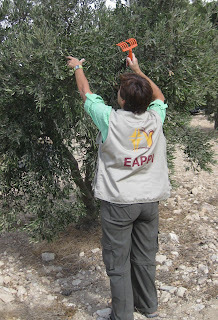 Often six people are needed per tree, each one planting feet in one spot and allowing the olives to fall to the ground. When all the olives are picked from a tree, the twigs and leaves are removed. Below Ann, Emily, and Jill are cleaning the olives. Then the olives are stored in burlap bags.﻿ Here are the 17 bags of olives our group filled from 39 trees. A good day's work. On Tuesday, we'll drive the olives to the Latrun Monastery, some twenty miles west of here, where the olives will be pressed into oil and poured into bottles especially made by a glass maker in Hebron. 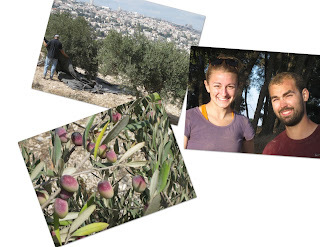 Up until last year, the olives were pressed just five miles away in Beit Jala. However, the Israeli government has added an 18 % Value Added Tax, since the pessing takes place in the West Bank. So it's one of those tough decisions: Support the Palestinian economy or keep that 18 % for those in need of medical care? Olives are a staple for every Palestinian family. Trees normally survive for centuries, so they are passed down from one generation to another like family heirlooms. They are planted, cultivated, watered, pruned, and cared for as if they were a member of the family. 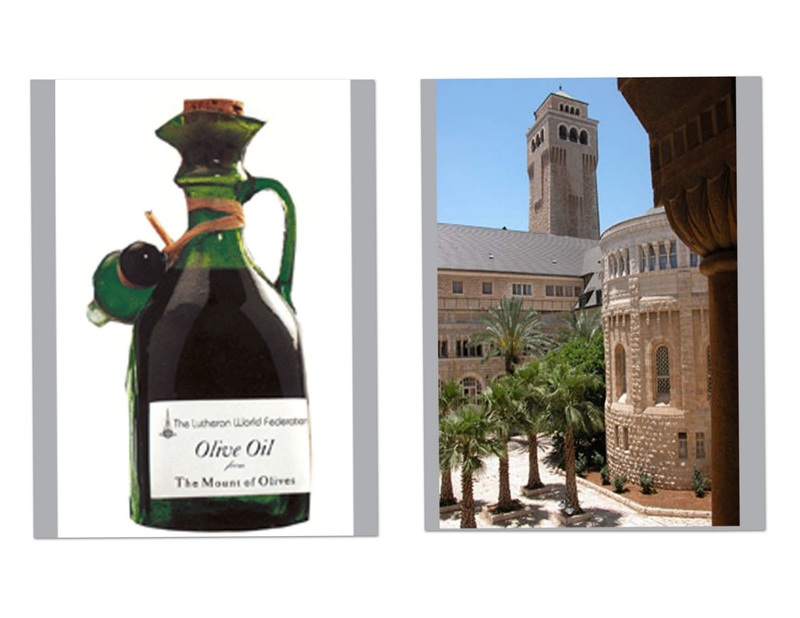 The olive provides food, as also oil for cooking, medicinal purposes, and fuel for lamps. The wood and pits are used for fuel. No wonder that the olive branch is a symbol for peace. No wonder in earlier years, olive oil was poured over the head in blessing. Ten million olive trees dot the terraced hillsides of the West Bank, making up 45 % of cultivated land. The annual income for processed olive oil alone is over one hundred million dollars. The future of the Palestinian economy is tied directly to those twisted roots seeking moisture in the shallow, rocky soil. The harvest is nothing but labor intensive. Once Palestinian farmers passed the time with songs about olive trees and celebrated as families joined hands in this common task. Yet the political situation has turned olive harvest songs to a minor chord. Bull dozers do not hestitate to uproot these family heirlooms when it is in the occupiers' interest or convenience. In other cases, West Bank Palestinians frequently find themselves harrassed by settlers when they attempt to harvest their own trees or they find the trees already picked under the cover of night. Occasionally shots are fired. The newspapers report plenty of episodes, but enforcement of law is not a priority when settlers are involved. An article in this mornings paper noted that there have been 27 official complaints to the border police already this season. Yet it noted that Palestinians no longer bother to file complaintes since there is rarely any follow-up. Settlers have their own standard of law and order. So it was that eighty-year old Rasmia Awase found her forty trees near Luban a-Shariqa chopped down near the the stumps several days ago. She had planted them herself, and cared for them throughout her lifetime, hoping to leave them as a legacy for her grandchildren. Now she can only water the stumps with her tears. Rabbis for Human Rights reports that six hundred trees near another settlement in the south were picked clean before the Palestinian owners could get to their fields. And so the story goes. One newspaper writer suggested that the settlers were angry at the peace talks and the settlement expansion moratorium, so they wanted to send a lesson-- no different than the school set on fire near Nablus or the mosque burnt near Bethlehem, with graffiti signed by settler vandals. The olive branch is supposed to be a symbol of peace. Here it has been turned into a token of racial hatred and extremism by people claiming to act in the name of God. Donna, pictured above, is a fellow Lutheran from the Southeast Michigan Synod-ELCA (wearing her distinctive EAPPI vest) who is one of 27 World Council of Churches "Ecumenical Accompaniers" spending three months here this fall, walking with Palestinians, often helping with the West Bank harvest as a matter of justice and security for Palestinians. Donna and others will harvest a few olives in the process. However, her presence will provide hope for Palestinian farmers feeling harrassed by those nearby and disheartened by a world with no resolve to bring about peace. Her presence may even deter a few acts of vandalism, and her witness may even bring some criminals to justice. 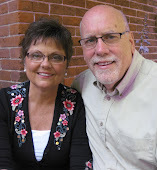 Donna is here for the olive harvest out of her deep faith. Bishop Burnside from Wisconsin also arrived this week with a group who will spend several days in accompaniment through the olive harvest. 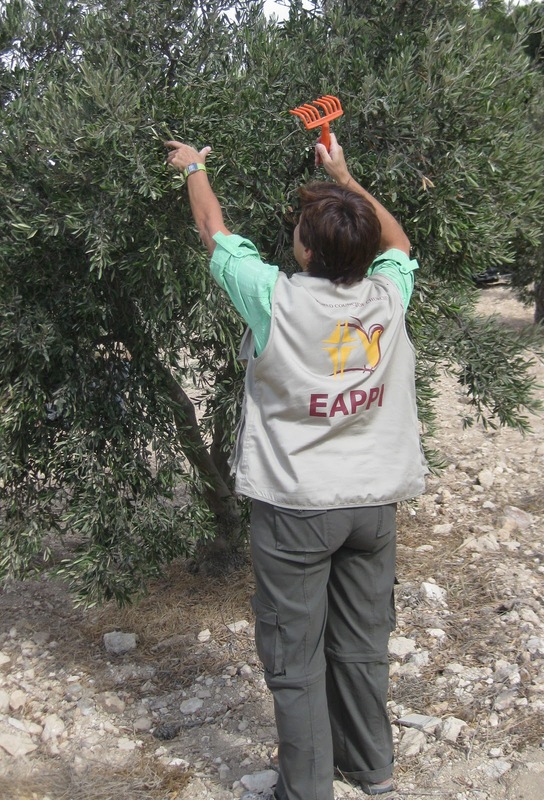 Similarly a Sabeel group picked olives last week in the northern West Bank. Oxfam and Rabbis for Human Rights are also active in safeguarding this ritual followed for thousands of years in these rugged hills. Our prayer request is simple. 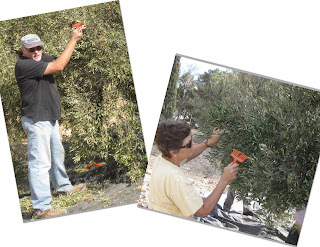 Pray for a safe and productive olive harvest. Pray that the olive branch once more becomes a sign of peace.